There are some instances in which graffiti can be considered a form of art. Bright, colorful murals add a bit of cheer to historic cooridors of large cities and inspirational messages along white picket fences help to lighten the mood of those who pass by. But not all forms of graffti are art. Broken bathroom mirrors, defaced bus stops, and spray paint tags on elevator doors – these acts are nothing more than pure vandalism, and there’s nothing beautiful about them. And the worst part of all is that these acts of vandalism can severely harm the businesses and families living in the communities in which they occur. The cost of graffiti goes far beyond repairs. Research shows that when vandalism occurs, the surrounding neighborhoods actually experience an increase in crime. A number of negative consequences follow, including vacancies in commercial spaces, lower housing values, and delays in construction projects. That’s why it’s important for Fort Collins property owners to take a proactive approach when it comes to these matters. And one of the best ways to do it is by installing anti-graffiti film for your Fort Collins property. 1. Install security cameras – The presence of cameras alone can help deter vandals. Vandals don’t want to get caught. They are much less likely to commit their crime in some place where security cameras are noticeable. 2. Post security signs – If you do have a surveillance system in place, you may want to consider posting signs in the windows of your home or property. These work in a similar way to cameras by using psychological tactics to reduce the risk of vandalism. 3. Hire security staff – If your school or business is experiencing major issues with vandalism, you may want to consider amping up your security staff and hiring a couple extra team members. 4. Install anti-graffiti film – Another option to protect your property from vandalism is by installing anti-graffiti film. 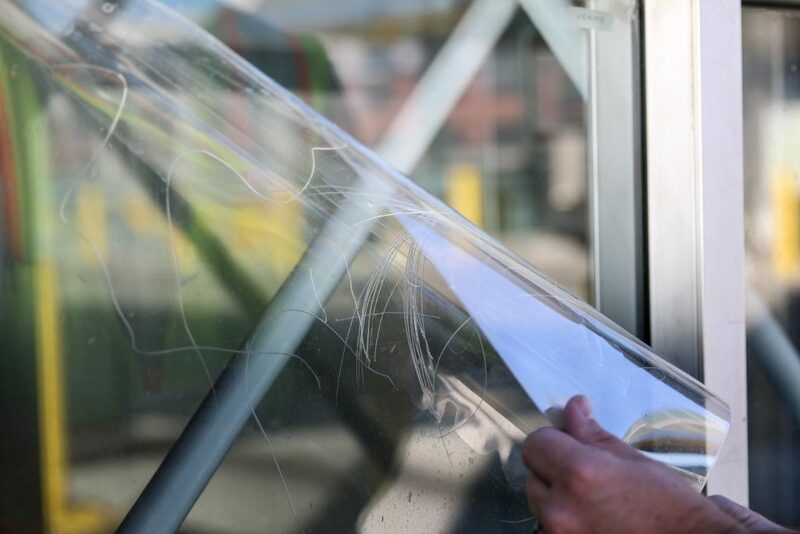 Installing a graffiti protective film can help keep your building from being damaged by scratching, spray paint, marker, and etching. Of all the options listed above, by far the most cost-effective solution is installing anti-graffiti film for your Fort Collins property. All of the other methods can help reduce your risk of vandalism, but they don’t actually solve the problem of what to do when vandalism occurs. With anti graffiti films, you can remove vandalism quickly by simply uninstalling the film and replacing it with a new sheet. This is a much more cost-effective option than investing in expensive surveillance systems or constantly replacing items after they’ve been vandalized. Put an end to your vandalism problems today. Call Green Light Window Films to have anti-graffiti film installed for your Fort Collins home, school, or commercial space.